Heat oven to 425°F. In large bowl, toss fennel slices, bell peppers and onion with oil. Place in ungreased 15x10x1-inch baking pan. Bake at 425°F. for 5 minutes. Remove pan from oven. Add snapper fillets to pan; sprinkle with salt and pepper. 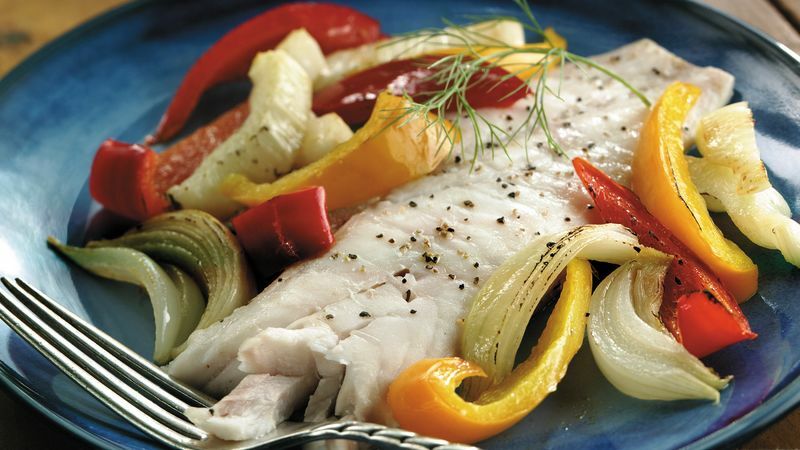 Surround fish with partially baked vegetables. Return to oven; bake an additional 10 to 15 minutes or until fish flakes easily with fork. Garnish fish with fennel leaves. Both types of fennel are used in cooking. Florence fennel, also called finocchio, is the bulb that is prepared raw and cooked in salads, stews and soups. Fennel seed comes from common fennel, which doesn't produce a bulb. The aromatic stems and feathery greens from both fennels are nice in salad. When green bell peppers are allowed to ripen on the vine, they turn red. Yellow, orange, purple and brown sweet bell peppers are different varieties. Fennel, red and yellow bell peppers are all excellent sources of vitamin A.
Roasting is cooking foods in the oven without a cover. Roasted foods have a browned exterior and a moist interior.